-- None -- 5 - ft. 6 in. 6 - ft. 6 - ft. 6 in. 7 - ft. 7 - ft. 6in. 8 - ft. 8 - ft. 6 in. 9 - ft. 9 - ft. 6 in. 10 ft. 10 ft. 6 in. 11 ft. 11 ft. 6 in. 12 ft. 12 ft. 6 in. 13 ft. 13 ft. 6 in. 14 ft. 14 ft. 6 in. 15 ft. 15 ft. 6 in. 16 ft. 16 ft. 6 in. 17 ft. 17 ft. 6 in. 18 ft. 18 ft. 6 in. 19 ft. 19 ft. 6 in. 20 ft. 20 ft. 6 in. 21 ft. 21 ft. 6 in. 22 ft. 22 ft. 6 in. 23 ft. 23 ft. 6 in. 24 ft. 24 ft. 6 in. 25 ft. 25 ft. 6 in. 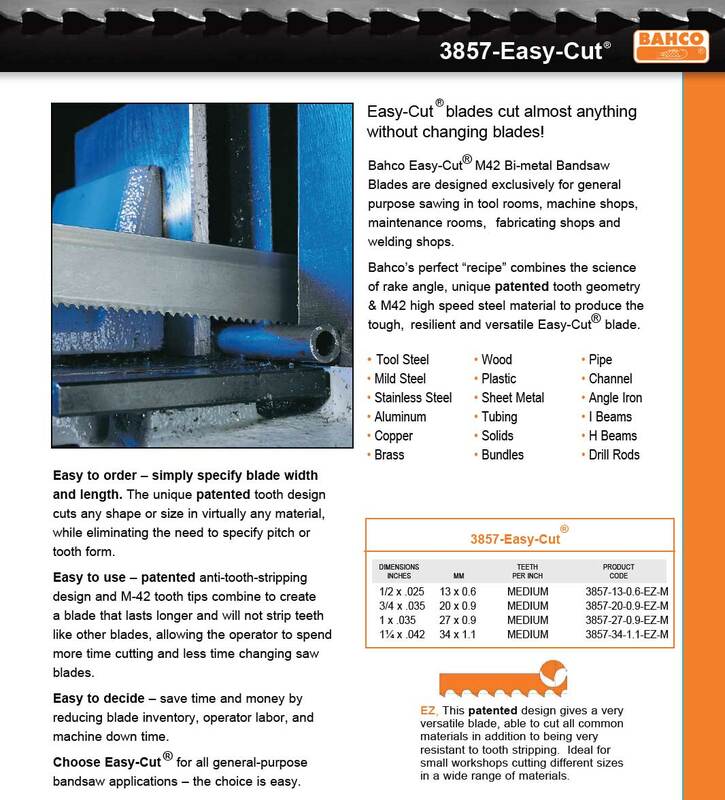 26 ft.
Bahco 3857 Easy -Cut Blade Cut Almost Anything - Without Changing Blades! Weld Charge is Included In Prices. Click the button below to add the Bahco 3857 M42 Bi-metal Bandsaw Blades 1/2" Blade + Length to your wish list.